January 11, 2013, Las Vegas, NV - Newer Technology, Inc. (NewerTech®) http://www.newertech.com, a leading developer of Macintosh®, PC, iPod®, iPhone®, and iPad® performance upgrades and accessories, announced today that the NuGuard® KX, a kinetic energy 'X-Orbing' protective case for Apple iPhone 5 and iPhone 4/4S models, was named a winner in the Beatweek Best of Show awards for 2013 International Consumer Electronics Show (CES). Beatweek's on-site editorial team presented awards to the most innovative new consumer tech products among the tens of thousands of new products introduced in various categories by the thousands of vendors exhibiting at CES. The Beatweek Best of Show 2013 awards will be included in the next issue of Beatweek Magazine to be released on Tuesday, January 15. "We're thrilled that the NuGuard KX has been recognized by Beatweek with a Best of Show award," said Larry O'Connor, President, Newer Technology, Inc. "With the NuGuard KX's certified protective qualities and slim, easy-to-install one-piece design, this award truly reflects its innovative features." Unlike common military-impact test grade iPhone case materials that can add bulk, the NuGuard KX uses state-of-the-art X-Orbing gel technology to absorb and evenly distribute kinetic energy to protect an iPhone from accidental drops or scratching. This hyper-advanced gel is then engineered into a stylish and effective one-piece design. The NuGuard KX is Quanta Laboratories certified to withstand the Shock Test Method of the MIL-STD-810G U.S. Military Standard for elite protection. Yet, the KX is barely half an inch thick so it can easily fit and slide into a pocket. And its Edge Guard over-molding provides enhanced iPhone screen edge protection without interfering edge-to-edge touch finger accessibility to ensure hassle-free touch keyboarding and ability to drag and organize app icons from screen to screen. With its precision molded buttons and accessibility cutouts, the NuGuard KX allows for full operability of all function buttons and access to all of the iPhone's ports. The backside of the KX features a crosshatch texture design for added grip that doesn't make it hard to remove from pockets like other texturized cases. With its one-piece design, installing an iPhone into the KX is an easy, several seconds process. To prove its effectiveness, Newer Technology created several videos to demonstrate the protective qualities and durability of NuGuard KX in extreme use scenarios. To document Quanta Laboratories' Mil-Spec certification, the recognized and required Method 516.6 Procedure IV (Transit Drop) test from 48 inches was recorded. Next, a NuGuard KX protected iPhone 5 was dropped from 20 feet – five times higher than the Mil Spec test height – from warehouse racking onto a concrete floor. Finally, the ultimate X-treme test… an iPhone 5 safely ensconced in a NuGuard KX was dropped from Other World Computing's towering on-site wind turbine. To view the videos, visit www.newertech.com/kx. 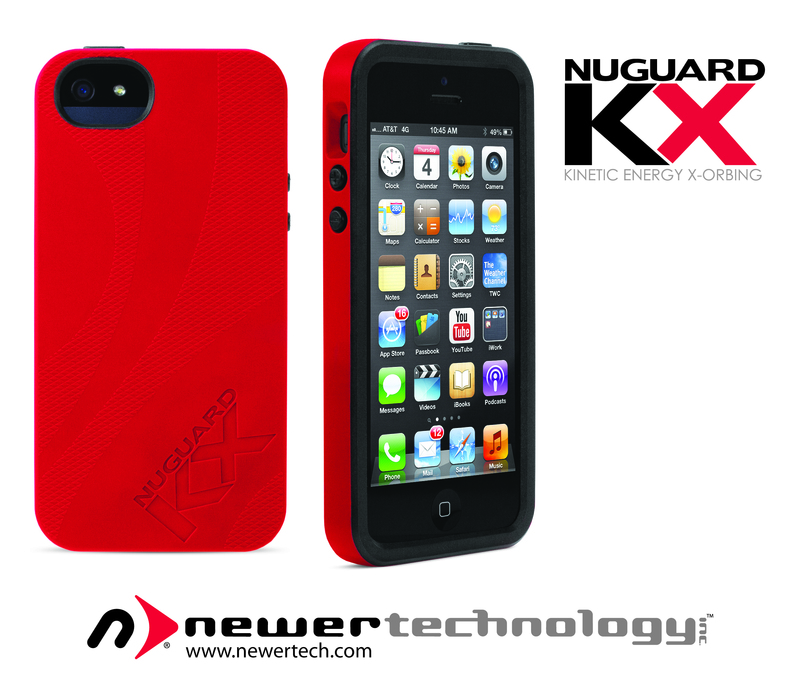 In addition to protecting the iPhone, the revolutionary NuGuard KX provides ultimate peace of mind ownership. The best-engineered case deserves the best possible warranty, so the NuGuard KX is backed by a best-in-class full replacement Lifetime Warranty. The NuGuard KX protective case has an MSRP of $49.95 and is available for immediate ordering in eight color combinations: Trooper (white body and black trim), Roulette Red (red body and black trim), Midnight (blue body and black trim), Buzz (black body and yellow trim), Darkness (black body and black trim), Rose (pinkish-red body and white trim), Nubar Forest (green body and black trim), and Eagle Shield (tan body and green trim. For more details on the NuGuard KX, as well as reseller inquiries, visit: www.newertech.com/kx. Since 1984, Newer Technology, Inc. (NewerTech) has been recognized as the leading developer of performance upgrades and accessories for Macintosh and PC computers, iPods, iPhones, and iPads. NewerTech industry awards include the 2012 CustomRetailer EXC!TE Award and the 2012 American Business Award "People's Choice" Award. Dealer inquiries are welcome by calling 815-308-7001 or by emailing sales@newertech.com. OWC, NewerTech, and the NewerTech arrow logo are trademarks of New Concepts Development Corporation, registered in U.S. Patent and Trademark Office. Apple, Macintosh, iPod, iPhone, and iPad are trademarks of Apple Inc., registered in the U.S. and other countries.